Jared Bernstein (via Paul Krugman) highlights an amazing breakdown in the prospects for reducing economic inequality any time soon. Over the last 30 years, the U.S. has made no progress whatsoever in increasing college graduation rates. To be specific, 25-34 year olds in 2009 had a college degree rate of about 40%, almost exactly the same as for 55-64 year old baby boomers. In the meantime, other industrialized countries were racking up substantial gains, most spectacularly in the case of South Korea where a little over 10% of 55-64 year olds have college degrees, but more than 60% in the 25-34 age group do. If you want to understand how South Korea has gone from a poor developing country to an industrial powerhouse within our lifetimes, this is one big reason. As we can see, the U.S. has fallen from a tie for second with Canada among current OECD members (Russia is not a member) to 15th in the OECD. The big question is why this is happening. One major reason is rising college costs, which have far outstripped overall inflation. Note: Average annual rate of growth of published prices in inflation-adjusted dollars over a 10-year period. For example, from 2000-01 to 2010-11, average published tuition and fees at private four-year colleges rose by an average of 3.0% per year beyond increases in the Consumer Price Index. See link above for further data on tuition and fees plus room and board. As we can see, the rate of cost increase for public four-year universities was the most rapid of all. One big reason for that, of course, is reduced state support of higher education. Citing State Higher Education Executive Officers, the National Conference of State Legislatures reports that state appropriations per student, at $6928 in fiscal year 2009, was more than $1000 below its FY 2001 peak, and lower in real terms "than in most years since FY 1980" (p. 1). As Bernstein argues, Pell grants are one way to offset this problem, and he points out that the Obama administration has strengthened the program. However, the Ryan budget would slash Pell grants, among many other programs, in order to fund a tax cut for millionaires of almost $400,000, per Bernstein. As Alan Krueger noted in January, there is a strong relationship between higher inequality and lower social mobility. The OECD data show that the U.S. is making no progress on one of the most important tools for social mobility, college. If access to higher education in this country actually declines, as it is threatening to do, our inequality problem will become infinitely harder to solve. "To be specific, 25-34 year olds in 2009 had a college degree rate of about 40%, almost exactly the same as for 55-64 year old baby boomers." It said has attained tertiary education, not college degree. That includes community college degree, and I think just some college too. That's a big big difference. And in fact, if you just had 4 year degree or higher, the US might look even worse compared to other countries. Thanks for the comment. 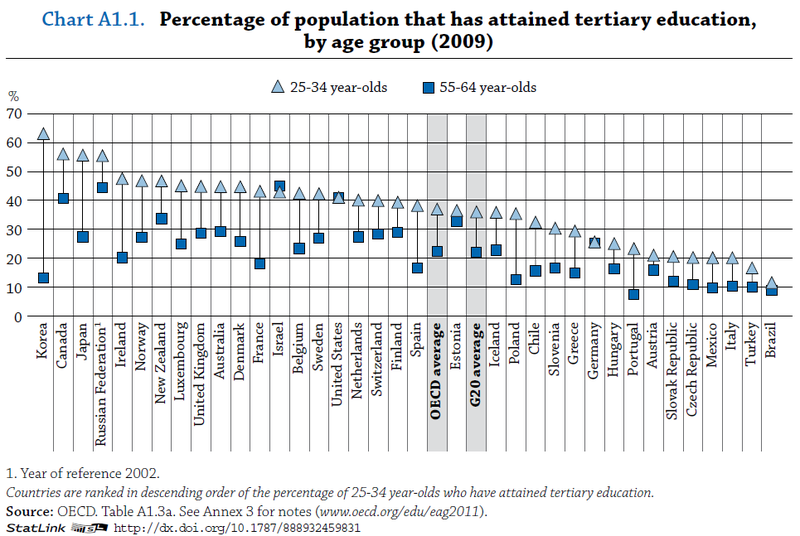 "Attained" does mean completed, as we can see by matching up this statement in the report with the chart above: "On average across OECD countries, 37% of 25-34 year olds have completed tertiary education, compared with 22% of 55-64 year olds." (http://www.oecd.org/dataoecd/61/47/48630299.pdf) Table A1.3a referenced in the chart I posted, and available in the link in this reply, breaks down the rates for community colleges ("Tertiary-type B")and 4-year college (Tertiary-Type A") and above. The U.S. has remained stable at both levels: 9% of both 25-34 and 55-64 year olds have a community college degree, and 32% of both groups have a college degree or above. By comparison, in South Korea, 38% of 25-34 year olds have a 4-year degree or better (tied for second with the Netherlands behind Norway at 45%; but the Netherlands has only 2% with a 2-year degree and Norway 1% in this age group) and 25% of 25-34 year olds have a community college-type degree, for a total of 63%. Among 4 year degrees and better, the U.S. was number 1 for 55-64 year olds, and just tied for 11th with Japan among 25-34 year olds. This is actually a tad better than the overall numbers, but nothing to write home about. Did the study track two cohorts over time or is this a snapshot? Because if 55-64 year olds in the USA today are going back to school to get degrees and doing so in larger numbers than in other OECD countries, that would partially explain the proximity between the numbers for the two groups. I.e. suppose we look at a batch of 55-64 year olds today. Suppose that 30 years ago half of them got a degree and half didn't. That's a graduation rate of 50%. But if in 2009 half of the people in this same cohort who did not get degrees 30 years ago go back to school and graduate, the graduation rate for this particular 55-64 year old cohort would be 75% today. Hence the data would should a graduation rate for 55-64 year olds of 75%, when in fact it was 50% 30 years ago. If this is what's happening then things aren't as terrible as they seem- it just means we are pretty good at getting older folks back to school. 1. How do these numbers compare to the change in the financial benefit of going to school? In other words, has tuition cost inflation outpaced growth in the college wage premium? 2. If the increases in tuition costs in other countries have been lower than in the USA, how much of this effect is due to the fact that more and more foreign students have migrated to the USA to study, boosting demand for US universities and easing demand pressures in other countries? "If access to higher education in this country actually declines, as it is threatening to do, our inequality problem will become infinitely harder to solve." To anyone paying attention it is a fact that access HAS declined. Affordability is access, and college has never been more unaffordable than it is today. Quantifying cost increase relative to inflation and the CPI is an appropriate exercise for an economist, but it does not address affordability relative to the consumer's current means. As a non-economist, here is how I see it: I attended a state university beginning in 1976. The cost of tuition for 1 semester was equivalent to 144 hours of the minimum wage (gross dollars, no books, no fees). A semester's tuition, ($460 per credit hour, 15 hours) at that same school today, at the state's minimum wage of $7.25/hr, would cost 951 minimum wage hours. If affordability is equated to what is practical for a college student to earn, then the tuition cost has gone up 660% since my days. Add in books, fees, living expenses, etc., and you get the picture. Your percentages may be correct, but they fail to reflect the magnitude of gap, the chasm, that has opened up in the affordability of college. Until economists such as yourself find a way to directly express the true increase in college costs in the only currency available to most college students, their labor, your numbers will lack meaning. College has been a key component in the American Dream. But this part of the American Dream has been surviving on sacrifice and debt for a generation, and the real cost, measured as a portion of what can be earned, has exploded in the last 30 years. The conversation, for most of us, has moved beyond whether college is affordable, it is not, but whether it is even worth it. That is how I know this country is in decline. Across all of American public education, increasing the amount of funding has accomplished little to nothing in terms of achievement. Blaming reduced state support is a red herring. If colleges want it to be affordable, then they would take the steps necessary to keep it that way. Perhaps now that the gov't owns the student loan market, 4 year colleges have even less incentive to keep costs down? I think you are barking up the wrong tree. You see inequality as a function of lack of gov't funding/support. You might consider that the inequality comes as a result of gov't bureaucrats subverting a free market, effectively jacking up the price of college until it is no longer affordable. Anonymous at 6:44 plays the free market card, inferring prices would drop to some sort of acceptable equilibrium, and rid ourselves of predators, and then implies the direct loans are a cause of market distortion instead of the privatized loan guarantee programs of the recent past. Yes, there are distortions. But please bring more to the table than a magic wand. This data confuses: (1) tuition sticker prices with (2) net tuition prices actually paid. Net tuition prices paid at public schools are actually flat. The business model is "high sticker tuition, high discount". As states reduce support, sticker prices paid by the rich go up to accomplish price discrimination and make the net tuition actually paid more progressive in nature. Great point, thanks for bringing it up. It'd be great to see histograms of both gross and net college costs for various types of schools. Also, compare that to histograms of college wage premiums for different schools and how those have changed over time. All these factors should help us get a somewhat better understanding of what is really going on. Thanks for the reply. I would love to see the data. Another trend is the awarding of, for instance, scholarships by public institutions as a way to draw 'high' academic performers eventhough they come from well off families...not so progressive. This includes out of state applications. In MA, 'in state' tuitions are increasing also. The cost of a college education has been constantly increasing and yet the average wages of a college graduate is barely increasing. How do you expect the percentage of people who attained tertiary education to increase?